Def Leppard guitarist Vivian Campbell and his band Last In Line have been confirmed to play a festival in Wales in July 2017. 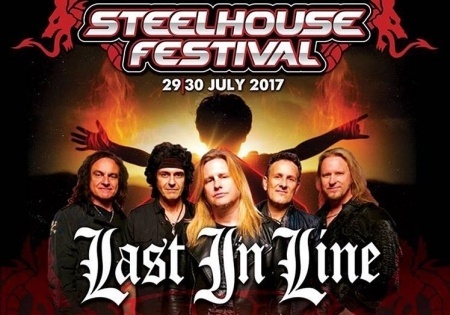 The show takes place at the Steelhouse Festival. A classic rock festival in Gwent, Wales. The band's first show in the country since the Hard Rock Hell X festival date in Gwynedd, Wales in November which opened their Heavy Crown tour. 2016 tour mates Saxon will headline the second night of the two day event on Sunday 30th July 2017 with Last In Line playing before them. Also on the bill are Steve Harris' British Lion, King King, Jared James Nichols and Broken Witt Rebels. Day tickets cost 50 pounds and are on sale now. Other UK/European shows are likely to be announced around the same time. The first show announced for 2017 since their 2016 tour ended in Belfast, Northern Ireland on 3rd December. The show announcement backs up Vivian's recent news that Def Leppard will tour for only three months in 2017. The debut studio album Heavy Crown was released on 19th February with plans in place to record a second album in 2017. The band's first time playing in this city and at this festival.